When is a Goal Offside? We’ve all been there, no matter which team we support: the feeling of being robbed of a game, 3 points, or worse, even a trophy because our opponent scored a goal that was allowed despite being blatantly offside. Or maybe we scored and it was onside and it was disallowed. The TV pundits are crying for blood, the video replay show he was clearly either offside or onside, and yet no call, no win. Or perhaps, you are amongst the few that get little twinges of guilt when the wrong call goes in your team’s favor. Either way, the offside call is perhaps the most influential and yet misunderstood decision a football ref can make in a game. I could probably spend an entire post for each part of this rule clarifying, diagramming, and using photos and videos to help you understand this rule better, but I’m going to give you the benefit of the doubt that you’ve played or watched enough football to understand the rule as written. Well, that and I’ve got things to do. There are so many examples where the ref has gotten it wrong. And even more examples where people are very divided (and not necessarily by team lines) as to whether it was wrong or right. The example I chose for this post happens to be the Samuel Eto’o goal from the recent Round of 16 Champions League match at Bayern Munich. This has nothing to do with my personal feelings about either team, only that it is a great example of one of the possibly offside goals that is harder to judge, even in the replays. And now a still picture taken from video at the moment the ball is being passed forward, although I have seen others who may be a frame or two later, so you may want to refer to the video for your own call. I have also added a yellow line for your convenience, something neither the Assistant Referee nor the Match Official had the luxury of. Okay, so now you get to answer a simple question: Was this goal offside? Please post your guess below in the comments, or if you are really shy, send it to me by using the “contact me” button on the top right. (I will keep your vote confidential, but just use it for our count) I will tally everyone’s responses and also post the official Milan Obsession answer in about 24 hours from this initial post. So come back tomorrow and see how you would do as a referee!! First, let me say thank you to everyone who weighed in on this one, especially those with actual experience as a ref. When these controversial calls happen, I often hear the most ridiculous things, so it is nice to know that so many people do know a little something of what they are talking about. Secondly, a shout out to mlisi39 for being the first one to point out that the linesman was not at all in a position to get this right. This is the most telling part of this controversy. The assistant referee is always supposed to be lined up with the second to last defender, with the offside calls being a very important part of his/her job. It becomes luck, not skill or judgment, to make the correct call if you are out of position on this one. For me, this is more important to the call than where anyone else is lined up. 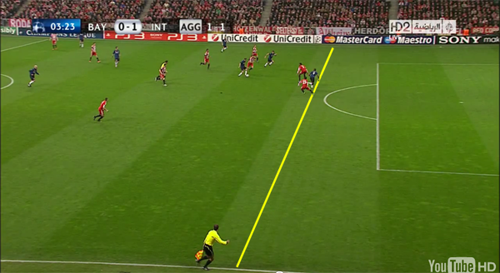 Yes, the Bayern defender blew the offside trap, as some of you mentioned. But I will refer you back to my first point in that an offside trap only works if a)the linesman is in the right position, and b)he/she sees it and signals. So unlike referees, we can watch this and many other video clips of this goal, and many of us also saw it on TV, perhaps in HD, numerous times. I have to say that I swore that Eto’o was offside from my TV viewings, other clips, and even some other stills floating around the internet. Eto’o’s torso and head at least were clearly ahead of the second to last defender’s foot at the time the ball was passed forward. Some of you wisely pointed out that arms don’t count toward offside, and you are right. You cannot play the ball with your arms or hands (they do not give you any advantage) and are not offside. (see p. 100 of FIFA Laws of the Game ) But what I saw was more than just arms. We had 15 people weigh in their opinions on this one. Three trusted their own instincts over my resident graphic tech’s freeze frame image and said that Eto’o was offside. The other 12 used logic and/or that picture to say he was onside. And there were different reasons offered for people’s individual choices. So… what is the official Milan Obsession answer? Onside. Why? Because whether or not Eto’o was in an offside position, the linesman did not signal this, and the match official did not blow his whistle, rather, he allowed the subsequent goal to stand. And after all of this talk, that is all that matters. Period. Sorry, I’m afraid that this was a bit of a trick question. 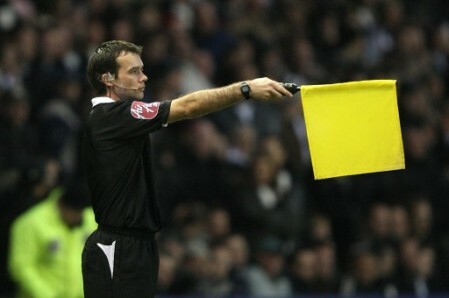 But this shows the human element to reffing the beautiful game. As a fan, sometimes it goes your way, other times it breaks your heart. In the end, though, whatever the referee calls or doesn't call, it stands. The officials do their jobs to the best of their abilities. Without them, we could not have our football. And to be fair, in a 90 minute match, they make a tremendous amount of calls that are right - a vast majority. Unfortunately for everyone, it’s the ones they don’t that we remember. So You Think You Know van Bommel? Juventus-Milan 0-1: Gattuso to the rescue!